Sharon Sullivan examining a publication of the Australian Heritage Commission. Sharon Sullivan is Director of the Australian Heritage Commission, the national agency responsible for developing a comprehensive register of areas of cultural and natural significance and for promoting their conservation. She previously served as Deputy Director of the National Parks and Wildlife Service of New South Wales. Nicholas Stanley Price is Deputy Program Director, Training Program, the Getty Conservation Institute. For over twenty years Sharon Sullivan has been involved with cultural resource planning in Australia. Throughout her professional life she has dealt with the issues of conservation and site management. Since the mid-1970s she has taught professional courses on site management and protection, including several organized by the Getty Conservation Institute. Ms. Sullivan served as principal instructor for the GCI's annual course on "Rock Art Site Management and Protection" in 1989, 1991, and 1992, and helped develop the Graduate Diploma Course in Rock Art Conservation at the University of Canberra in collaboration with the GCI. She also consults with the GCI on site management projects in China and in Baja California Sur. This spring, she spoke with Nicholas Stanley Price, GCI Training Program Deputy Director, about her experiences. Nicholas Stanley Price: From the beginning of your career you've been interested in the management of cultural sites. What does it take to successfully implement site management plans? Sharon Sullivan: A lot of plans don't work because they haven't been developed with all the key interest groups involvedor at least in agreement. There's a tendency to call in an outside expert who might develop a wonderful plan, but one that doesn't get implemented. The reason for that may be two-fold. The key peoplewho are often politicalare not necessarily sold on the idea. They don't understand it, they haven't been through the process that led you for perfectly good reasons to make certain decisions. So the political will may be missing. Secondly, a management plan has to fit the culture and bureaucratic climate of the place for which it is developed. You have to keep in mind what people are going to be able to do. There's no point in doing a perfect plan if there's no way of implementing it. Sometimes when people talk about the use of local consultation in Australian site management, they say: "Well, their aboriginal population has to be consulted by law. In other countries, it's different." Presumably you'd strongly disagree with this? I do strongly disagree. We started consulting aboriginal people in 1973, and by 1977 we had successfully implemented a system whereby no site got managed, destroyed, or developed without consultation with the local community. However, there's still no legislation to insure that. In Australia there's been a move for more active involvement of indigenous people in site management so that all government agencies involved would have aboriginal peoples trained as rangers or administrators. In the United States, too, there's been a mounting interest in consultation. The concerns are similar. People are fragmented, you don't know who to talk to, there's no direct association, and so on. These are problems that can be overcome. It is interesting and exciting to see the revival of interest among indigenous people and groups reclaiming their culture. When you talk about local consultation, are you including all local groups? Of course. You need to have people involved and committed. It's only common sense. But it also relates to the fact that the heritage belongs to the people. How do you see cultural resource management in relation to natural resource management? In Australia we're moving toward an integration of these things. Certainly we have the opportunity to do so with the organization I now work for, the Australian Heritage Commission, which advises on both natural places and cultural sites. The 20th century tide of Coke bottles which is affecting the environment so badly is also sweeping away traditional lifeways. In both cases we've reached the stage that we're really looking at little islands of things that are left in the middle of this sea. It's important to see things in an integrated way. One of the clearest examples of integration is the aboriginal view of the environment. Sites are sacred to aboriginal groups because the landscape is sacred. These sites are pinpoints in a sacred landscape, a focus of the power in the landscape which is made and upheld by the aboriginal ceremonies. The significance of the site is seen within the context of its environment. The same holds true for cultural places, whether they're historic or prehistoric. They arise out of an interaction with the landscape. If there is a methodology to assess the importance of cultural and natural values, then the potential for conflict is not great. 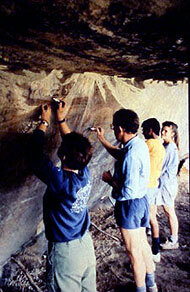 Rock art site, Laura, Australia. Are there areas of cultural heritage preservation in which Australia has been particularly successful? I think one of the things we've been able to contribute is a less formalized, more relaxed, and more opportunistic way of dealing with the range of issues related to conservation. By comparison, a lot of sites are much better managed in the United States because of more resources, more staff, and a bigger population to support them. Australia, on the other hand, has had to develop a number of management techniques that are low-key, practical, and cleverwhich is what management is all about. We've tended to develop approaches that allow sites to manage themselves to some extent. In that sense, I suppose, Australia can serve as a model for countries with few resources. Australia, in part because of its position on the edge of Asia, in part because of its remoteness and this on-the-ground problem solving ability, is in a good position to do that. On the other hand, we in Australia are also learning an amazing amount from Asia, particularly about the different views of the past. The Venice Charter is written for monuments, mostly for ancient monuments, and mostly for monuments which relate in large part to a past civilization. There's this feeling about the past and about keeping things intacta need for authenticity and respect for the original fabric. There is also the issue of significance. It often seems that the real significance of something like the Pyramids or Chartres Cathedral is its beauty and craftsmanship. But this is often quite different for a temple in Thailand or in China which may be as old or as historically important but is part of a living culture that responds to it in a different way. There, it is the sense of place that is important, as opposed to the fabric, which is analogous to the aboriginal approach to place. Determining why we value a site or place is really the first step, isn't it? Yes. The first thing is to look at the cultural significance. By doing that, you reveal the values and nuances in the society, which may or may not relate to the fabric of a site. If you do this firstrather than rushing in and saying, "well, this is 15th century, we should preserve it"then the other things follow. Thinking about the cultural significance of things has the potential to change people's ideas about the past. If you get people to actually think about why things are there, then interesting ideas develop. You get ideas that are sometimes difficult for professionals to deal with, and which cause conflicts in our own disciplines. But they're important. We've done some interesting studies which indicate that people's views at the local level of what is important in their past are different from the standard sets of significance. They might end up with 80 or 90 percent of the same places, but the reasons they value themand therefore the way in which they think future development should happenare different.